Nov - 16 | By: lorenfelixkelly | no comments. PORTLAND, OR (November 12, 2012) – Road trip based travel and culture show GO! 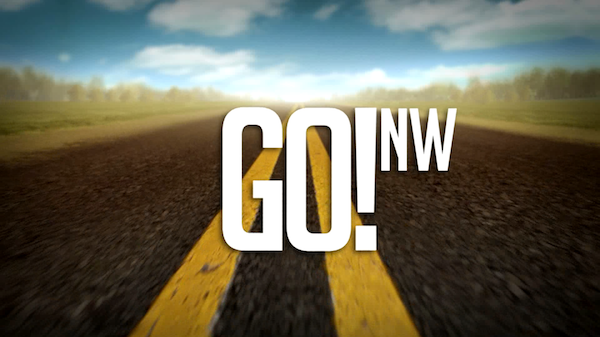 NW will premiere this November on KOIN 6. Dynamic and visually engaging, GO! NW utilizes creativity and high production values to provide a forum for honest and compelling story telling. It will air weekly on Sundays at 5:00pm PST, beginning November 18. Every week, host Leif Hansen will travel the Pacific Northwest in his 1968 solar/electric hybrid VW Bus collecting stories that showcase the unique personality of the region. Each episode is designed not only to be entertaining and informative but also to encourage viewers to visit the places and people represented. Both nostalgic and modern, GO! NW is a throwback to the “family TV night” of the past, when parents and siblings would settle onto the couch to watch shows like Wild Kingdom or The Wonderful World of Disney. GO! NW has something for everyone in the family to enjoy and discuss. The members of creative team behind GO! NW are no strangers to creating travel pieces and high quality storytelling. Prior to moving back to Portland in 2009, Producer/Director Tracy MacDonald and Creative Director Matt Zodrow worked with PBS/WEDU in Tampa, FL. They won several Emmys for their work on A Gulf Coast Journal with Jack Perkins and other special PBS/WEDU features, and have also worked for a variety of other clients including The Discovery Channel, The Travel Channel, Travelocity, and Disney. They are thrilled to be back in the Northwest, which they consider to be their true home.